Knox County, KY - Roadway design improvements which included the relocation of the roadway to better accomodate tractor-trailer traffic; slope failure stabilization; Surveying; Geometric Design; Pavement Design; Hydrology; Erosion Control; Cost; and Construction Administration. 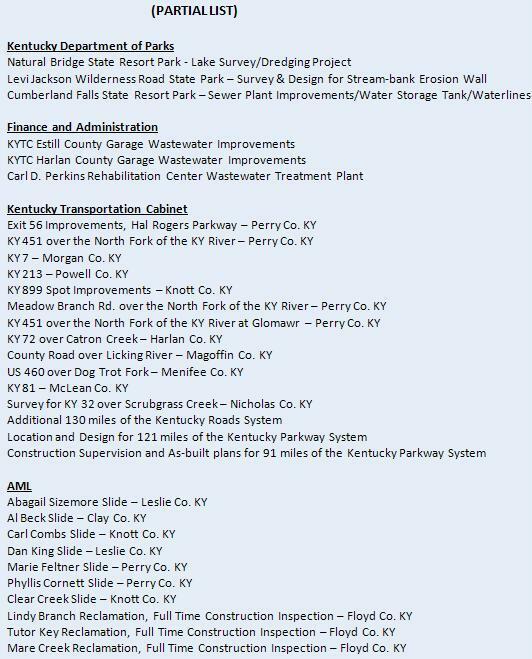 Floyd County, KY- Full Design; 15 miles of roadway (3 Sections) for the connection of KY 80 and US 23; Surveying; Geometric Design; Pavement Design; Hydrology; Hydraulic Analysis of Bridges and Culverts; Scour Analysis of Bridges; Erosion Control; Maintenance of Traffic; Cost; Deed Descriptions. Total (once fully completed) estimated cost of $108 million. Harlan and Bell Counties, KY - 3,800 acre+ Boundary Survey on and around Black Mountain. Local Relief of 3000'+ Boundary is so large it appears on the Kentucky State Highway Map.